How do I monitor AWS VPN tunnels using Amazon CloudWatch alarms? I want to receive notifications when my AWS VPN connection is down. 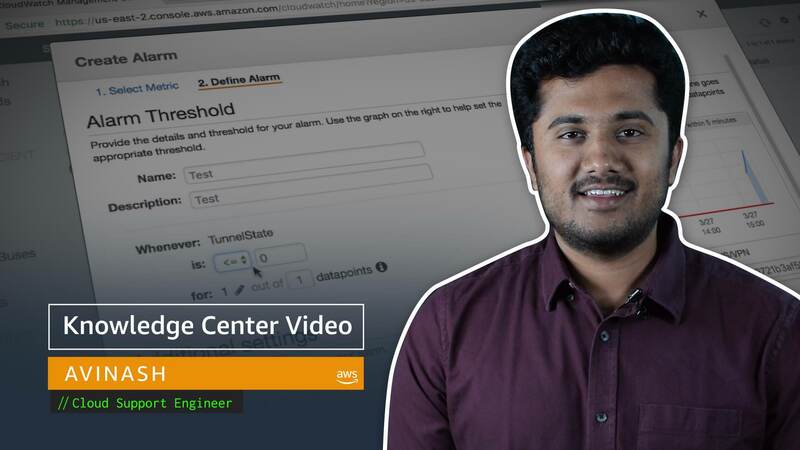 How can I configure Amazon CloudWatch alarms to monitor the status of my AWS VPN tunnels? You can monitor the status of an AWS VPN through its metric data, which is automatically sent to CloudWatch. The VPN tunnel state is reported as a Boolean value in the CloudWatch metric TunnelState, where 0 indicates that the tunnel is down and 1 indicates that the tunnel is up. You can set up a CloudWatch alarm based on this CloudWatch metric to notify you when one or both VPN tunnels are down. After you set up your AWS VPN and both tunnels are available, you can configure a CloudWatch alarm to monitor the connection. If you haven't already set up a topic for this alarm in Amazon Simple Notification Service (Amazon SNS), create an Amazon SNS topic, and then subscribe to the topic. Next, create a CloudWatch alarm for the VPN tunnel state. Optional: Test your alarm by making the tunnels of your AWS VPN unavailable so that you trigger a notification from your SNS topic. How do I check the status of my VPN tunnel?